How food distribution works today with endless middle men, warehouses, distribution and packaging companies, wholesalers and grocers is not the way things have always worked. 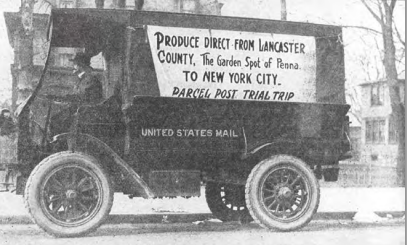 Our friends recently shared some surprising history about a food by mail system that could point to possibilities for revitalization of the postal service and the food system today! It all began in 1896 when the Rural Free Delivery Program was started and in 1913 it was connected to the postal service. The program thrived throughout World War 1 but fell victim to competition from the private sector as time moved on. Additionally, the construction of highways changed the way transportation of people and goods occurred throughout the country. As a policy experiment it was innovative, risky and bold. We need to see more of that if anything about how the food supply and distribution chain works. For information about workers who are organizing across the “food chain” check out the important work of Food Chain Workers. Love it! I worked for the USPS in the 80s (1980s, that is) and we handled baby chicks, bees, fully grown birds like pheasants, and prepared/preserved food. Aside from the small forest of trees being delivered every spring, I don’t recall ever seeing any produce go through the system.